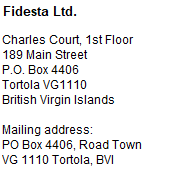 Please use this form to ask us any questions that You might have in regards BVI offshore services, International Business Companies, Special Licence Companies, offshore company administration or any offshore incorporation services that You might be interested in. An experienced member of our team will respond to Your question, usually within 24 hours. Please make sure to indicate Your email address or return contact particulars correctly, otherwise we might not be able to respond to You. Attention! If you wish to contact us in regards a job, please read the important information here. We will soon get in touch with you!